Do you often feel like no matter what you do, it’s just not enough? Do you struggle with a need to be perfect, to be everywhere at any time? Do you feel like crap when you come up short? I’ve got the perfect book for you. You may have heard of Brené Brown, a New York Times bestselling author widely known for her TED talk on vulnerability. I recently finished reading The Gifts of Imperfection , one of her earlier books, and I believe this is a must-read for all women. (Men will certainly benefit from it too!) Why? Women today have plenty of pressure to do and be it all. Because of what we see in the media and in our own social news feeds, we feel like we’re supposed to have it all together. Let’s be real here – do any of us have it all together? I sure don’t. Just 3 months ago, I locked myself and the dog out of the house. I forget important things all of the time. The first time I tried taking public transportation in Des Moines I missed the bus because I was on the wrong side of the road. There are way too many things I feel I can’t get right in life without the supervision of my husband, who is younger than me. Yep, there’s some shame in that. In all seriousness, the pressure we feel to live up to this expectation we have of ourselves can be draining. 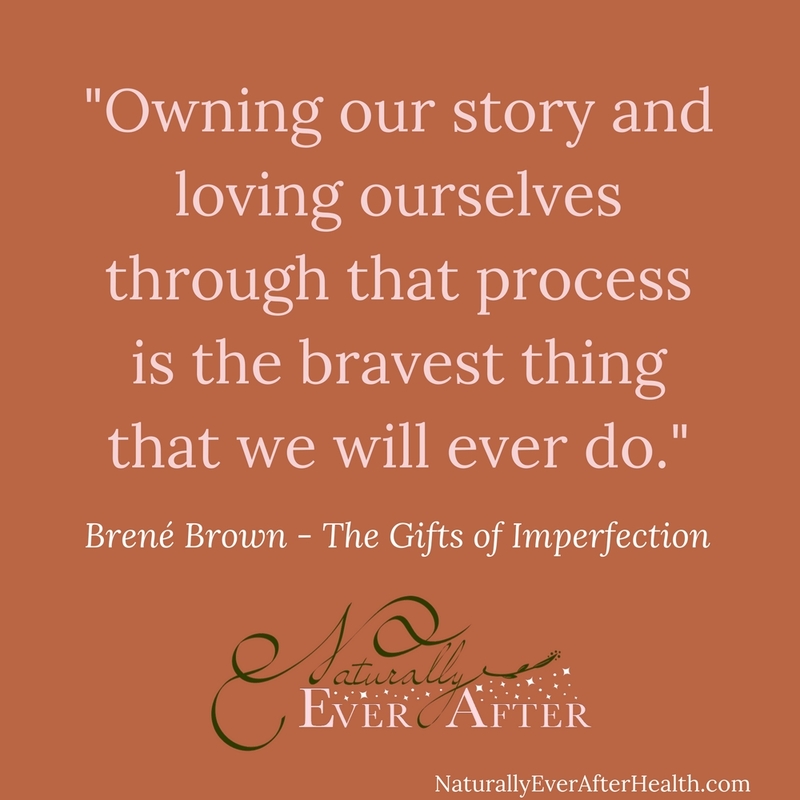 If you’ve ever felt guilt or shame for not being the person you feel like you’re supposed to be, The Gifts of Imperfection is for you. A new friend (who happens to be an awesome life coach) recommended this book to me after I told her about my struggle with binge eating disorder. She helped me see how my eating disorder may have stemmed from a lack of self-worth, never feeling like I’m good enough or doing enough. And she was right – confidence and self-worth have always been things I’ve struggled with. My friend was spot-on with this book recommendation. People, I was mind-blown after reading the preface. That’s the first line of the book…the first of several that I underlined. It seemed like every chapter, every paragraph even, spoke to what I’ve been struggling with internally for years. Maybe you haven’t had an eating disorder, but I think just about any woman can relate to the insights shared here. If this sounds right for you, here’s a little peek of what you can expect. The Gifts of Imperfection is a quick read that manages to gain depth and quality in every chapter. Brené Brown describes herself as a researcher storyteller, and she certainly comes through that way. Her book is not written in a way that only college professors and psychology students will understand. Brown shares her own awakening to this research, vulnerable experiences from her life, and meaningful conversations she’s had with people on the topic of wholehearted living. What I really enjoy is how she creates encompassing definitions for complex, broad terms, like belonging, authenticity, courage, shame and guilt. She breaks them down into eye-opening realizations, giving us a new way to think about what these words mean for us. 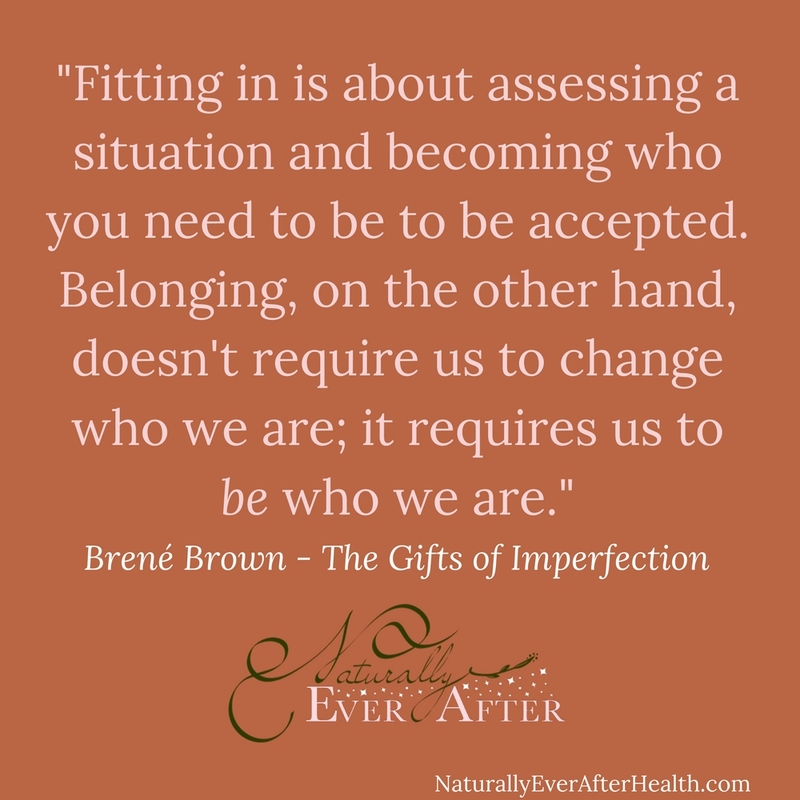 Brown shares what she has learned from interviewing thousands of men and women ages 18 to 87 on the topic of wholehearted living, how these people deal with shame and imperfection to engage with the world from a place of worthiness. The first 3 chapters focus on what she calls the gifts of imperfection – courage, compassion and connection. 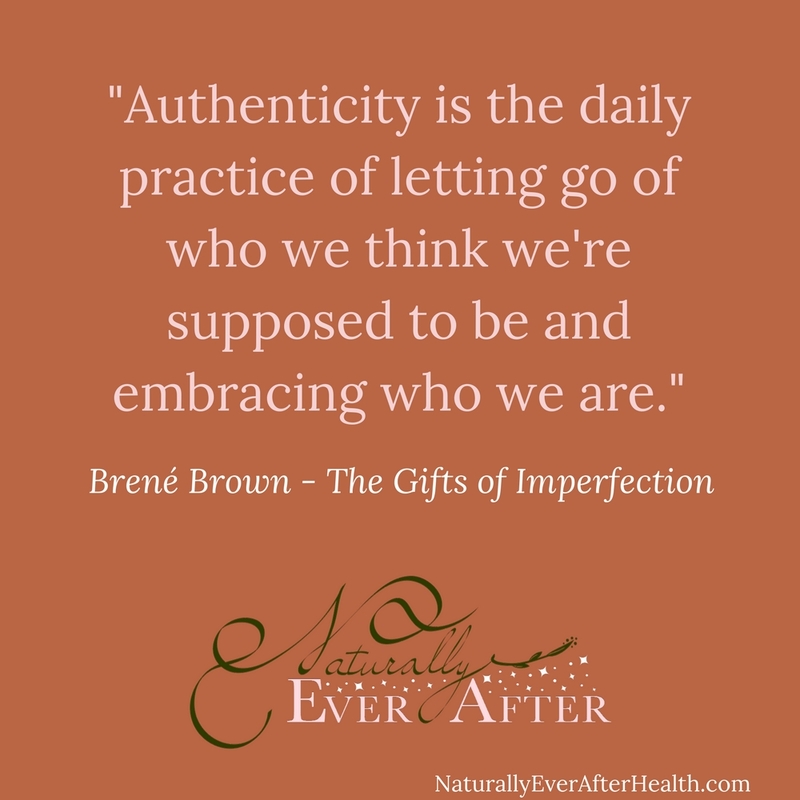 Engaging in a daily practice of using these gifts to overcome barriers, Brown says, is how we can learn to embrace our imperfect selves and cultivate worthiness. What follows is 10 guideposts (chapters) on how to cultivate worthiness and own our stories using those tools. The guideposts include topics like authenticity, self-compassion, intuition and trusting faith, and creativity and stillness among others. In each guidepost, Brown derives these complex psychological findings from personal, meaningful stories. She writes in a way that invites you to feel her humility and relate on your own individual level. A concept that I found to be especially eye-opening was on the topic of belonging and authenticity. In moving to a new state recently, I’ve been battling my lack of confidence and worthiness more regularly as I try to put myself out there to meet new people. Brown’s lesson on this topic has really helped me as I approach these settings now. I’m able to have more confidence in showing up as I am, knowing that being myself is the only way to find the people I belong with. Now when I go out into social settings, type an email or make a phone call, I think of this quote. Be myself and be totally okay with it. If they don’t like me, so what? That’s not the right group for me. There are plenty of other people in this world. This book hit home for me in several ways. Whether you struggle with perfectionism, lack of confidence or not belonging, please check out this book. Take notes and reflect on how these insights play out in your life. The Gifts of Imperfection also makes for a great book club option. Here’s a free Reading Companion to aid your discussion. Life is too short to not embrace our authenticity. We’ve got to stop shunning who we are and start celebrating ourselves. In doing so, we’ll find exactly where we belong and where we do not.